Land managers frequently work to restore landscapes that are dominated by non-native, invasive plants by seeding or planting natives. The goal is to assemble a native community that is resistant to future invasion by non-natives. This is sometimes accomplished by including fast-growing native plants in restoration projects. However, the inclusion of “weedy” natives may be detrimental to slower-growing natives, especially during initial establishment. 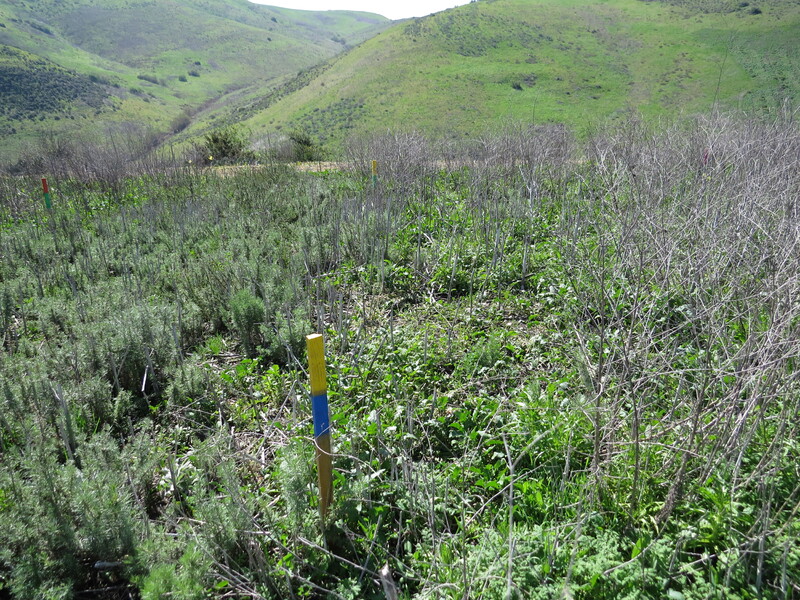 In a study recently published in Restoration Ecology, CEB collaborated with the Irvine Ranch Conservancy to determine whether fast-growing natives limited the establishment of native shrubs. Native shrubs and forbs were established together and separately in a restoration project in the foothills of the Santa Ana Mountains. Each type of native had greater establishment, growth, and reproduction when seeded alone than when seeded together, suggesting that competition occurred between the different types of natives. Their results suggest that restoration will be easier to implement when natives with different growth strategies are planted separately. Study authors are Sarah Kimball and Kailen Mooney with UC Irvine’s Center for Environmental Biology and Megan Lulow and Quinn Sorenson with the Irvine Ranch Conservancy.